The Po (/poʊ/; Latin: Padus and Eridanus; Italian: Po [pɔ]; ancient Ligurian: Bodincus or Bodencus; Ancient Greek: Πάδος and Ἠριδανός) is a river that flows eastward across northern Italy. The Po flows either 652 km (405 mi) or 682 km (424 mi) – considering the length of the Maira, a right bank tributary. The headwaters of the Po are a spring seeping from a stony hillside at Pian del Re, a flat place at the head of the Val Po under the northwest face of Monviso (in the Cottian Alps). The Po ends at a delta projecting into the Adriatic Sea near Venice. It has a drainage area of 74,000 km² in all, 70,000 in Italy, of which 41,000 is in montane environments and 29,000 on the plain. The Po is the longest river in Italy; at its widest point its width is 503 m (1,650 ft). The Po extends along the 45th parallel north. The river is subject to heavy flooding. Consequently, over half its length is controlled with argini, or dikes. The slope of the valley decreases from 0.35% in the west to 0.14% in the east, a low gradient. There are 450 standing lakes. The Po Delta wetlands have been protected by the institution of two regional parks in the regions in which it is situated: Veneto and Emilia-Romagna. The Po Delta Regional Park in Emilia-Romagna, the largest, consists of four parcels of land on the right bank of the Po and to the south. Created by law in 1988, it is managed by a consortium, the Consorzio per la gestione de Parco, to which Ferrara and Ravenna provinces belong as well as nine comuni: Comacchio, Argenta, Ostellato, Goro, Mesola, Codigoro, Ravenna, Alfonsine, and Cervia. Executive authority resides in an assembly of the presidents of the provinces, the mayors of the comuni and the board of directors. They employ a Technical-Scientific Committee and a Park Council to carry out directives. In 1999 the park was designated a World Heritage Site by UNESCO and was added to "Ferrara, City of the Renaissance, and its Po Delta." The 53,653 ha (132,580 acres) of the park contain wetlands, forest, dunes and salt pans. It has a high biodiversity, with 1000-1100 plant species and 374 vertebrate species, of which 300 are birds. The most recent part of the delta, which projects into the Adriatic between Chioggia and Comacchio, contains channels that actually connect to the Adriatic and on that account is called the active delta by the park authorities, as opposed to the fossil delta, which contains channels that no longer connect the Po to the Adriatic (but once did). 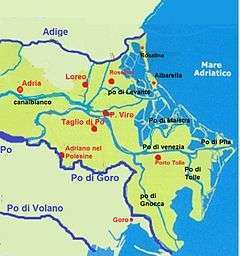 The active delta was created in 1604 when the city of Venice diverted the main stream, the Po grande or Po di Venezia, from its channel north of Porto Viro to the south of Porto Viro in a channel then called the Taglio di Porto Viro, "Porto Viro cut-off." Their intent was to stop the gradual migration of the Po toward the lagoon of Venice, which would have filled up with sediment had contact been made. The subsequent town of Taglio di Po grew around the diversionary works. The lock of Volta Grimana blocked the old channel, now the Po di Levante, which flows to the Adriatic through Porto Levante. The Mediterranean Basin is a depression in the Earth's crust caused by the African Plate slipping under the Eurasian Plate. Typically in geologic history the depression is filled with sea water under various geologic names such as Tethys Sea. In the last period of the Miocene Epoch, the Messinian (7-5 mya), the Messinian salinity crisis, a near drying of the Mediterranean, was caused by the sea level dropping below the sill at the Strait of Gibraltar and the equilibrium between evaporation and replenishment shifting in favor of evaporation. At that time the Po Valley and the Adriatic depression were a single canyon system thousands of feet deep. On the southwest the Apennine Mountains bordered a land mass termed Tyrrhenis geologically. Their orogeny was just being completed in the Miocene. On the north the Alpine Orogeny had already created the Alps. 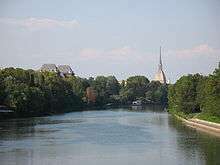 On February 24, 2010 the Po river was contaminated by an oil spill coming from a refinery in Villasanta through the Lambro, the Agenzia Nazionale Stampa Associata news agency has estimated that the spill is in the neighborhood of 600,000 liters. The Po river in San Mauro Torinese in July 2012. At the village of Isola Serafini in the comune of Monticelli d'Ongina, Piacenza Province, 40 km (25 mi) downstream from Piacenza, a 362 m (1,188 ft) long, 20 m (66 ft) high gate dam featuring eleven 30 m (98 ft) openings gated by vertical lift gates, crosses the Po. Nine gates are 6.5 m (21 ft) high and two are 8 m (26 ft) high for sediment-scouring purposes. A spillway to the right passes through a hydroelectric station of 4 generators of 76 MW each operated by a 3.5 m (11 ft) - 11 m (36 ft) head of water. The spillway connects to a diversionary canal subtending a 12 km (7.5 mi) loop of the Po. A ship lock 85 m (279 ft) long and 12 m (39 ft) wide next to the station passes some traffic through the canal, but above the dam traffic is mainly barges. The average flow at the dam is 854 m³/s, with a 12,800 m³/s maximum. The Po river is first certainly identified in the Graeco-Roman historians and geographers of the late Roman Republic and the early Roman Empire, long after the valley had been occupied successively by prehistoric and historic peoples: Ligures, Etruscans, Celts, Veneti, Umbri, and Romans. At that late date the ancient authors were attempting to explain the provenance of the name. Perhaps the earliest of these, Polybius (2nd century BC), uses Pados (in Greek) and says that it was to be identified with the Eridanos of the poets. Moreover, the country people call it Bodencus. Pliny (Hist. Nat., iii. 122) also gives the Ligurian name of the Po river as Bodincus, which he translates as "bottomless". The root bod- has been generally analyzed as containing the PIE base *bhu(n)d(h)- seen in Sanskrit budhnah and Avestan buna- "bottom", Greek pythmen "foundation", Latin fundus "bottom", Old Irish bond "sole of the foot". The word Bodincus appears in the place name Bodincomagus, a Ligurian town on the right bank of the Po downstream from today’s Turin. The Po river is often identified with the Eridanos or Eridanus river of Greek mythology. This mythical river is the namesake of the constellation Eridanus. 1 2 3 4 5 6 Zwingle, Erla (May 2002). "Italy's Po River Punished for centuries by destructive floods, northern Italians stubbornly embrace their nation's longest river, which nurtures rice fields, vineyards, fisheries—and legends". National Geographic. Retrieved 6 April 2009. 1 2 3 4 Raggi, Meri; Davide Ronchi; Laura Sardonini; Davide Viaggi (2007). "Po Basin Case study status report" (pdf). AquaMoney. Retrieved 6 April 2009. ↑ "Carta d'identità". Parco Delta del Po: Emilia-Romagna. Retrieved 14 April 2009. ↑ "Protected Area". Parco del Delta del Po. Retrieved 14 April 2009. ↑ "Active Delta and Fossil Delta". Parco Delta del Po Veneto. Retrieved 15 April 2009. ↑ Grove, Alfred Thomas; Oliver Rackham (2003). The Nature of Mediterranean Europe: An Ecological History (2, illustrated ed.). Yale University Press. p. 341. ISBN 978-0-300-10055-6. ↑ McKinney, Frank Kenneth (2007). "Chapter 6: Pleistocene and Holocene Sediments". The northern Adriatic ecosystem: deep time in a shallow sea (illustrated ed.). Columbia University Press. ISBN 978-0-231-13242-8. ↑ J.P.M. Syvitski; et al. (October 2005). "Distributary channels and their impact on sediment dispersal". Marine Geology. Elsevier. 222-223 (15): 75–94. doi:10.1016/j.margeo.2005.06.030. Retrieved 2010-05-21. ↑ "Facing Water Challenges in the Po River Basin, Italy:A WWDR3 Case Study". waterwiki.net. 2009. Retrieved 6 April 2009. ↑ "Haze in the Po River Valley, Italy". NASA Earth Observatory. 2009. Retrieved 6 April 2009. ↑ Recchia, Roberto. "IL QUADRO DEL SISTEMA IDRICO DEL COMUNE DI MILANO". Comune di Milano. Retrieved 7 September 2015. 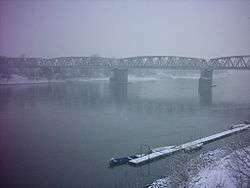 ↑ "Italian river 'full of cocaine'". BBC News. 5 August 2005. Retrieved 6 April 2009. ↑ "Oil spill threatens Italy's Po River". CBC News. 24 February 2010. Retrieved 24 February 2010. ↑ "L'Ente" (in Italian). Autorità di bacino del fiume Po. Retrieved 5 June 2009. ↑ "Elements of Good Practice in Integrated River Basin Management: A Practical Resource for implementing the EU Water Framework Directive" (pdf). Brussels, Belgium: WWF–World Wide Fund For Nature (formerly World Wildlife Fund). October 2001. Retrieved 6 June 2009. ↑ Bortone, Giuseppe (18 March 2009). "Po Basin (Italy)" (pdf). Istanbul: Autorità di Bacino del Fiume Po. Retrieved 6 June 2009. ↑ Brunelli, A.; D. Caputo; F. Chillè; V. Maugliani (2003). "The bump of a boat into a gate-structure dam: An unusual risk scenario". In Llanos, JA; Yague, J. Dam Maintenance and Rehabilitation: Proceedings of the International Congress on Conservation and Rehabilitation of Dams, Madrid, Spain, 11–13 November 2002 (illustrated ed.). Taylor & Francis. pp. 145–146. ISBN 978-90-5809-534-3. ↑ Daiches, David; Anthony Thorlby (1972). Literature and western civilization (illustrated ed.). Aldus. p. 78. ↑ Historia Naturalis, Book 37, Chapter 11.